LeFou’s Brew is a slushy apple drink popular at Walt Disney World! 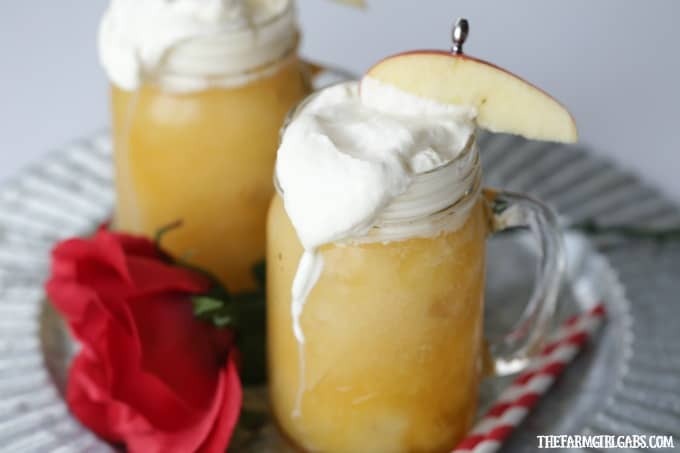 This deliciously refreshing drink recipe is inspired by the upcoming Beauty And The Beast movie. Now you can make your own LeFou’s Brew at home with this simple recipe. Have you ever had a chance to enjoy a LeFou’s Brew when visiting the Magic Kingdom in Walt Disney World? If you haven’t I am going to try to describe it to you the best I can. AMAZING! How’s that for a detailed description? No seriously, LeFou’s Brew, which is served at Gaston’s Tavern in Fantasy Land (and named after his sidekick), is an slushy appley (is that even a word?) drink with a hint of marshmallow. It is topped with a mango whipped cream. It’s frozen deliciousness. 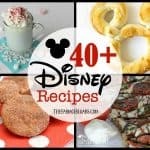 Since we are all anxiously awaiting the premiere of Beauty And The Beast on March 17th, I thought I would recreate this recipe so we all can enjoy it at home. LeFou’s Brew is definitely on my list of Must Do Disney Snacks when I visit Walt Disney World. I think I mentioned this before but slushy drinks are my downfall! If available, I always opt for a frosty treat no matter what time of year. You’ll want to first start by whipping up some heavy cream (in a cold bowl ) with some mango juice. The whipped cream will not be super thick but that is ok. It will firm up enough to top of your drink when ready. To make a LeFou’s Brew, you will need to whip out your blender . Add one can of frozen apple juice, some water, a little bit of mango juice and some marshmallow syrup . I like mine extra slushy so I add some ice too. When you are done blending your brew, pour into a glass or mug and top with a generous helping of the mango whipped cream. This apple drink is so refreshing. I know you are going to love the hint of mango and marshmallow. It’s so simple to whip up your own brew at home too! LeFou's Brew is a slushy apple drink popular at Walt Disney World! 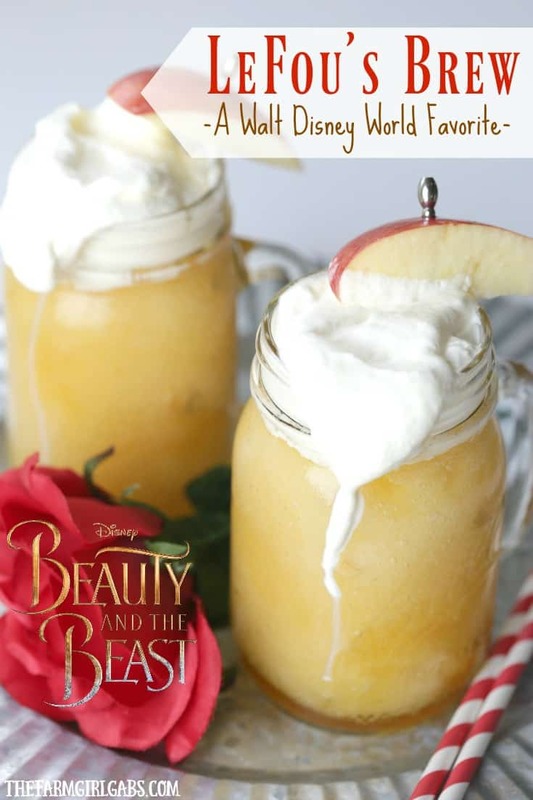 This deliciously refreshing drink recipe is inspired by the upcoming Beauty And The Beast movie. Now you can make your own LeFou's Brew at home with this simple recipe. In a cold bowl, add whipping cream, 4 tablespoons mango juice, 2 tablespoons passionfruit juice and sugar. Whip until soft peaks form. Refrigerate until ready to use. To make LeFou's Brew, add apple juice, water, one ounce mango juice, marshmallow syrup and ice to a blender. Blend until thick and smooth. Pour in a mug and top with mango whipped cream. Yum! 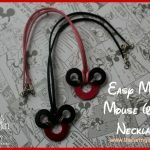 This is on my list of things to try while we are at WDW this summer. But maybe we’ll do it before we get there! Great recipe!